The Osage Ballet performed at the Festival of Families on Saturday evening around 7 p.m. at Logan Square. Pope Francis arrived at Logan Square at approximately the same time as the Osage Ballet’s performance. According to Randy Tinker Smith, the Osage Ballet Director, the Pope appeared at Logan Circle Square approximately five minutes before the Osage Ballet began. “Osages were setting their chairs around the drum as he rounded the corner. They were all on stage as the popemobile passed by the stage,” Smith said. She described the scene: “We were on a lit stage above the crowd and we waved to the Pope,” Smith said. Soon, the Pope took his place on the main stage. “We were close enough to record his arrival. We were honored to be allowed this close access to the Pope and to be among the Festival of Families performers during the Pope’s visit to Philadelphia,” Smith added. Smith hopes to share photos, and possibly video, when she returns to Oklahoma this week. 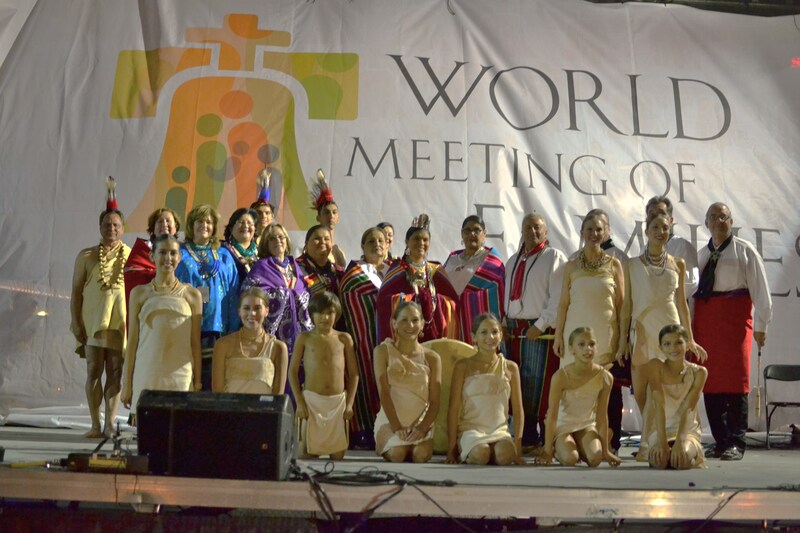 The dancers performed the prayer scene from Wahzhazhe, an Osage Ballet, accompanied by the drum and nine Osage singers. The group, traveling by charter bus, will begin their return trip Sun., Sept. 27, with plans to arrive in Pawhuska, Okla., Mon. evening, Sept. 28. Visit the Osage Ballet Facebook page for photos from the performance and visit to Philadelphia.